This morning I was pulling into a gas station pump when I witnessed an occurrence that was disturbing after I thought about it. The gas station was crowded, with every row filled with a customer. The station also had parking spots facing the convenience store. A woman, driving this huge Suburban (let’s call her (“Suburban Driver”) with kids in the back seat, was backing out of one of the convenience store spots got very close to hitting the minivan at the pump next to me. The driver of the miniwan,(we’ll call her “Minivan Lady”) honked her horn as she was afraid the Suburban will surely hit her car. It got close, but nothing was hit. I expected Suburban Driver to just shrug and keep going, but instead, she got very furious that she got honked at. Her face contorted into an angry mask, and instead of just driving away, she actually got out of her Suburban and started yelling and gesticulating that Minivan Lady should relax. “CALM DOWN I WAS NOT ABOUT TO HIT YOU – YOU f—*** b–*** !! !,” which seemed really ironic given she was the one losing her temper. Suburban Driver got really aggressive and went up to the window of Minivan Lady who just locked her doors and looked aghast. Suburban Driver finally went back to her car and sped off, driving aggressively. Minivan Lady was quite shaken. After witnessing this encounter, I was perturbed that someone would get so aggressive and exhibit violence over something as trivial as getting honked at, and in front of kids. I really shouldn’t be shocked–we’ve heard of fights breaking out over parking spots and people coming to blows at Christmas sales. But actually seeing how people react and get ugly made it more glaring. Who can say what frame of mind she had to begin with? She may have been stressed but that is no excuse. If someone could potentially get violent over a trivial incident, can you imagine how people would react when there is a disaster? If you are the one starting to feel stressed and agitated, take a step back and take a deep breath. The cliche about counting to 10 works. Put yourself in the other person’s shoes and empathize with what they may be going through. If you are the target, do not let the matter escalate – you always have a choice to walk away. Pride and “being in the right” won’t matter much to your family if you get hurt or killed. Pray for patience and strength to overcome any difficulties. Leaving early instead of late will avoid the stress of being rushed. Keeping at least a quarter to half a tank of gas at all times avoids having to stop at a gas station when it’s inconvenient. Getting out of debt means less worries. Having food stored at home means not having to run to the store. 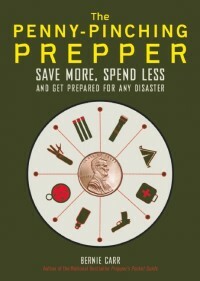 Being prepared goes a long way toward giving you peace of mind, whether a disaster happens or not. What you witnessed was just the tip of the iceberg. I investigate violent crimes for a police department. I’ve seen people get shot, stabbed, beaten and killed over the dumbest things in the world. These range from $5 to disrespect, to minor accidents, etc. My personal opinion is this is the result of the entitlement mentality. No one accepts personal responsibility anymore. If people did, they wouldn’t react the way they do. Instead, they are always right and everyone else is wrong and they don’t know any other way to react. You offer some good advice on how to avoid the confrontations. But it will only get worse as the economy worsens. Hi Adam, That’s what I suspected, that this is just the tip of the iceberg-I wish it weren’t so, but people are just really on edge. We don’t know who is a ticking time bomb out there. Thanks for the comment. Scary. I saw this every day in Charlotte and when I moved to the small town I am in now. it’s like another world. I was at the gas pump and I shouted to my daughter “I love this place can we STAY here?” The lady pumping gas next to me said “Why sure you can sweetheart>” Having PTSD. I found this a *great* reinforcement to going out and meeting my neighbors. I was so lucky. Your post is right on point, as they always are! angela h, Good for you, to now be living in a small town! I just have to keep remembering, it’s not like this everywhere. Thanks for the comment. Hi Joe H. It does seem like people are running around with a short fuse. And when that stock market drops and stays down, many more will be in a world of hurt. Thanks for sharing. #1’s are totally avoidable. Never worth it. Thanks for another great one! Hi Dan, Wow did not realize this was one of those “textbook” cases! Good to hear from you. Thanks for visiting! Great post. I think you hit the nail on the head–it’s stress in a person’s life that sets them up for these situations. For us to be able to respond calmly, ourselves, the less stress we have the better! The more at peace we are, the less likely we’ll be drawn into a negative emotional response to a bad situation. Really good bullet points. Hi Charlie, I am glad you liked this article. Thanks for visiting! Great article! I see this stuff all the time too. For some reason when people are in their cars they think they are invincible and that they aren’t subject to the laws of nature. A lot of people that I encounter nowadays are like small, aggressive dogs. In nature, small dogs would certainly not be aggressive towards larger animals or they would quickly be eliminated. With the artificially supported rules of civilization, all types of animals (including the human ones) usually aren’t subject to the consequences of their actions (sure there’s karma but that works on its own time scale). In a without rule of law (WROL) situation, those that behave aggressively towards others better be prepared to fight to the death to back up their threats. People behave foolishly because they aren’t held accountable for their actions. The lady in the suburban looking to start a fight clearly has no sense of reality as evidenced by the fact that she left her children completely vulnerable while she was raging out of control. Unfortunately, before too long, I’m afraid that some folks are going to be in for a shock when the police don’t come to their assistance after they threaten the wrong person. Be careful out there. Keep a low profile and don’t go looking to start fights or you may end up dead. Hi there A/F That is so true, these people have no business picking fights, and for what!?! It can only get worse as people find themselves more desperate. Thanks for the comment. Thanks for the link!! I appreciate the kind words.